Michael Hurley’s The Vineyard stakes its plot in three friends, Dory, Charlotte and Turner, coming together for a summer at Martha’s Vineyard. Each woman is plagued by a weight of despair hanging from her past which independently drives her to seek out the comfort of companionship and escape. Charlotte has recently lost a daughter to cancer and a husband to the indifference caused by their daughter’s death. 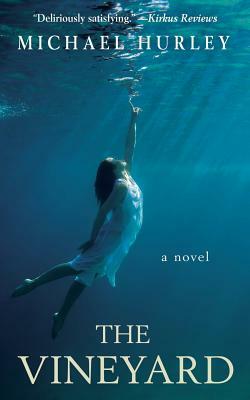 Dory is fending off the unwanted attention of longtime admirer Tripp Wallace, her mother, and her waning health. Turner is battling the internal demons of self-doubt and fundamental discontent with her failed relationships and lackluster career. Throw Enoch, the mysteriously ephemeral fisherman who illegally sells the most delectable shrimp in town during off-shrimp season, into the mix, and you’ve got a narrative full of comedy, mystery, shock, and scandal. Each woman struggles to the edges of physical death and moral doubting in order to come to terms with her own sense of self and to divine her purpose in the world at large. Hurley spins his novel from a somewhat dismal chicklet tale into a reeling mystery and crime novel as he aptly navigates questions regarding faith, the meaning of love, and the power of friendship. The novel is propelled forward by a constant shift in plot as numerous threads are picked up and woven together throughout the progression of the story. At times this constant shifting, though, can be distracting and can halt the momentum of the novel. The shock value of each turn of events, however, picks up the often frenetic storyline, putting it back on track and providing a rather rousing impetus to keep trekking through. Despite being a plot driven book, The Vineyard does justice to its underlying themes through Hurley’s strength in character development. The characters, if nothing else, are worth the entire journey. Each is so fully flushed out, so entirely herself, that you could blot out the names from the page and still comprehend each moment in the novel. Hurley does a fantastic job of creating characters that readers will fall in love with, despise and identify with on levels both desirable and unattractive. Published by Ragbagger Press in November 2014, you can find this book at your local bookstore. FTC Disclaimer: I received this book from Netgalley for a fair and honest review of the text. I enjoyed your review, Jaclyn. It’s always interesting to see what readers take from the text. Thank you.